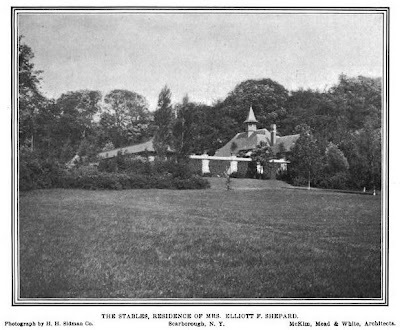 The Colonel Eliot F. Shepard residence designed by McKim, Mead & White c. 1893 in Scarborough, New York. Shepard, organizer of the Fifty-first Regiment of New York Volunteers and military recruiter in Elmira, NY, was married to Margaret Louisa Vanderbilt, youngest daughter of William H. Vanderbilt. He practiced law following his military career with Strong & Shepard and was organizer and president of the State Bar Association. 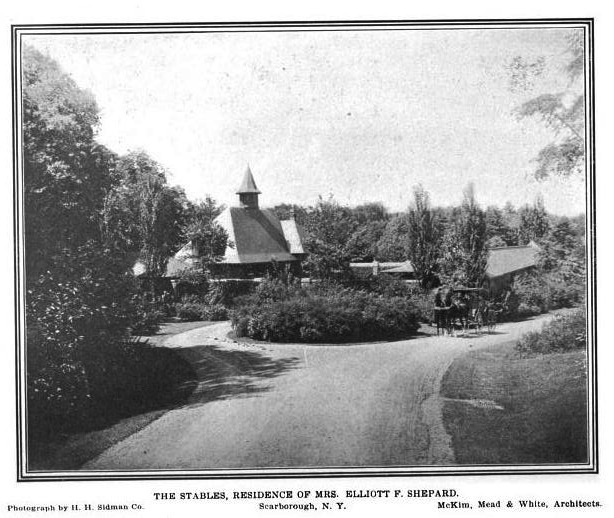 Shepard died in 1893, the estate was sold in 1910 and became the Sleepy Hollow Country Club the following year. Click HERE to see the Shepard residence on google earth and HERE on bing. Click HERE for more on the Sleepy Hollow Country Club. I wonder why the stables have a different roofline in the distant and closer views? Could it be that the handsome two story brick building in the second-to-last photo has another use and was mislabeled? Two different structures. 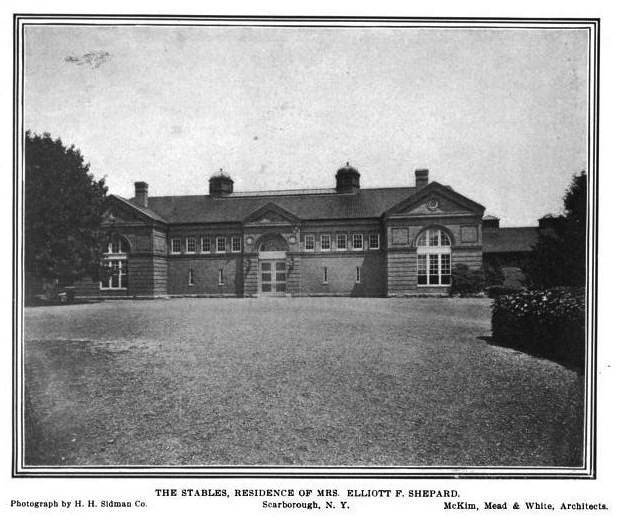 When looking at the rear of the house in bing, the stables in the first two pictures are to the left of the house and the one in the lower picture (the larger building) is to the right of the house. Mead: How do you propose to deal with the Vanderbilt house? McKim: The outbuildings will be easy enough. I'm a little concerned with the residence, as she's insisting on something very, very large. As was said about another Vanderbilt house,'satisfying in its vastness'. Surely, as Ancient points out, the completely insitutional service wing is one of McKim Mead & White's all time failures. Yellow brick is often such an unpleasant building material. This house looks terribly like a hospital. For those who have never been to this house, the scale is stupefying, every room, every door a quarter larger than it needs to be. Dilettante makes another very good point. This is that rare house that actually looks better in black-and-white. Great historic photos. I drive past the house on my route to Croton-Harmon weekly and the light brick color of the house actually stands out against the vast greenery of the property. The house color pops and it looks terrific. Daughter of the Late William Vanderbilt Succumbs Suddenly in Fifth Avenue Apartment. Had Attended the Wedding of Her Granddaughter, Louis Schieffelin, on Saturday. Mrs. Elliot F. Shepard, daughter of the late Commodore William H. Vanderbilt and widow of Colonel Elliot F. Shepard, former editor of The Mail and Express, died suddenly of a heart attack at 9:30 A. M. yesterday in her apartment at 998 Fifth Avenue. Mrs. Shepard attended the wedding of her granddaughter Miss Louise Vanderbilt Schieffelin, and Abraham S. Hewitt at the Madison Avenue Presbyterian Church Saturday afternoon. 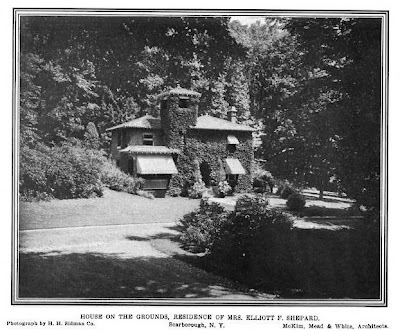 Following the ceremony she went to the reception at the Schieffelin home, 5 East Sixty-sixth Street. She spent Sunday quietly at home and was in her usual health when she retired. Yesterday morning Mrs. Shepard arose at her customary hour and had entered the breakfast room of her apartment when a sudden illness seized her. Her family physician, Dr. Allen M. Thomas of 8 East Fifty-second Street, was called and she was assisted to her bedroom. It was at once realized that her condition was serious, and Dr. Thomas, after applying restoratives, sent for Mrs. Shepard's daughters, Mrs. William Jay Schieffelin Jr., Mrs. Ernesto Fabbri and Mrs. Dave Hennen Morris. Mrs. Schieffelin reached her mother's side before the end came, Mrs. Fabbri and Mrs. Morris arriving a few minutes later. 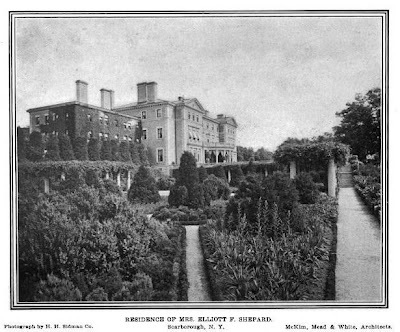 Her son, Elliott F. Shepard Jr. of Paris, who has been at Miami, Fla., was notified of his mother's death and at once started for New York. Mrs. Shepard was in her seventy-ninth year. Before her marriage she was Miss Margaret Louise Vanderbilt. She was born in the old Vanderbilt homestead on Staten Island and spent her childhood there. She was the youngest of Commodore Vanderbilt's children. At the time of her marriage to Colonel Shepard he was practicing law in this city. He afterward purchased the Mail and Express and was the editor of that paper at the time of his death in 1893. 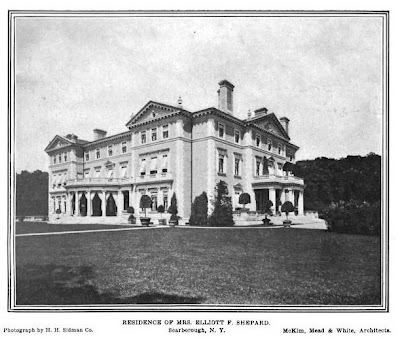 Mrs. Shepard had always occupied an important position in New York society and was widely known for her charitable work. She was especially interested in the Young Women's Christian Association. About twenty years ago she built the Margaret Louisa Home at 14 East Sixteenth Street, which is conducted by the association. For many years Mrs. Shepard had a Summer home at Bar Harbor, Me., and was one of the leaders in the New York colony at Mount Desert. 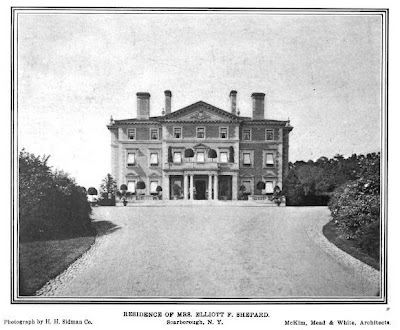 Following the marriage of her daughters she disposed of her place there, but had since visited Bar Harbor nearly every Summer with Mrs. Fabbri, who has a Summer home there. 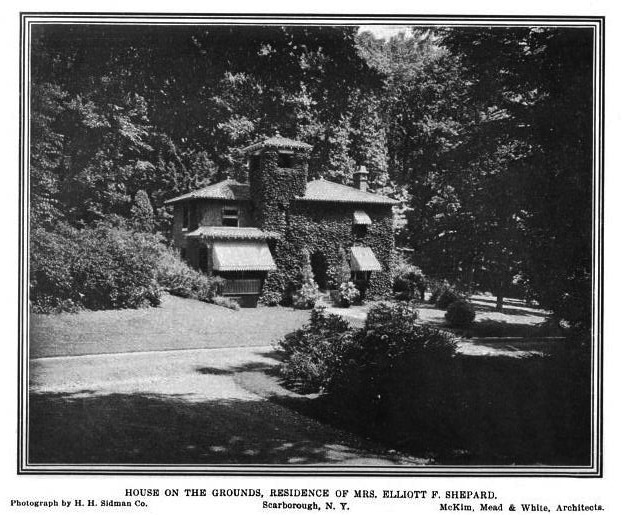 Mrs. Shepard had a country estate at Scarborough-on-Hudson, where she also spent much of her time. After her daughters were married she disposed of that to the Sleepy Hollow Country Club. Mrs. Shepard's funeral will be held at 10 A. M. Thursday at the Madison Avenue Presbyterian Church, which she had attended for many years. The burial will in the Vanderbilt family lot in the Moravian Cemetery on Staten Island. 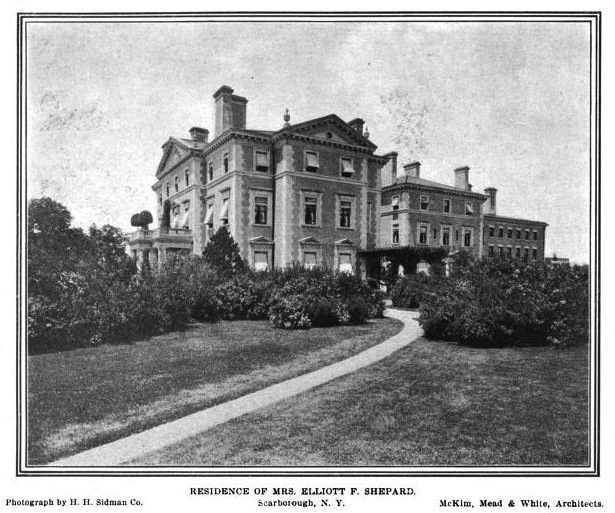 And a piece I wrote last year for New York Social Diary has pictures of Mossley Hall, the Shepard's Bar Harbor house, as well as of Mrs. Shepard's daughters Mrs. Morris and Mrs. Schieffelin. A very well housed family, those Vanderbilts. I agree that the house pops, but up close, the yellow brick is still unpleasant and institutional--either limestone or stucco would have been better.---and even though it is an example of McK,M&W on a slow day, and the service wing really is bad, it is still miles ahead of the best buildings by many other architects (no names mentioned). Notice how they've let ivy cover at least two of the three sides of that back wing -- as if to visually diminish it relative to the rest of the building. A favorite of mine in the Hudson Valley. The garden and entry facades are very appealing. One of the few great houses where you could demolish an entire wing and the house would be even stronger. 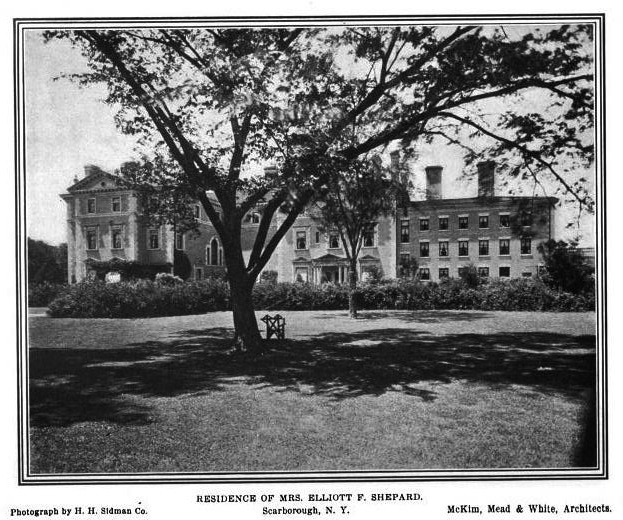 The dormitory service wing looks great later shrouded with ivy, but all 3 story service wings tended to look awfully institutional, (Bourne's Indian Neck home on Long Island comes to mind). 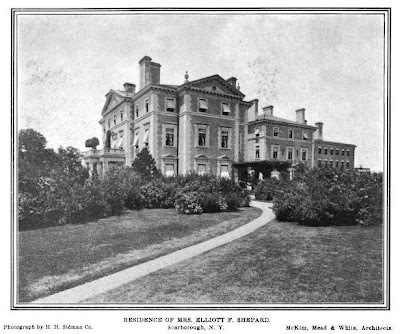 Its good to know a much maligned architect who designed some notable homes in Glen Cove NY, (hint: rhymes with Wembroke & Pinfield) had the good sense not tack on enormous institutional service wings onto the main block of his country homes, thus marring their overall composition. MM&W should have given CPH a call. I love the floor plan of this house. Also love the primary (entrance) facade. But...taken as a whole...the overall house is WAY too "rigid". Unquestionably...the service wing is awful. 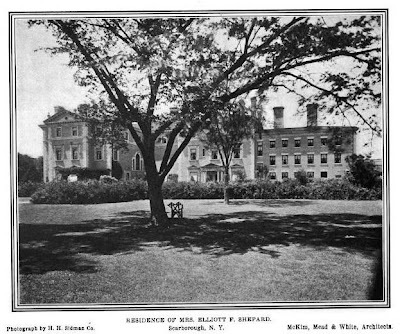 I've noticed in the old photos that it is covered in ivy and careful plantings minimize the severity of the service wing. Still, the ouse would be much better if that portion were amputated. The floor plan is magnificent though! It is the very definition of what separated an American Country Estate from, say, a British one...in the late 19th century. Each room flows beautifully into the next. The scale of every room is enormous beyond belief...but the carefully thought-out procession of rooms is wonderful. I disagree with previous comments about the yellow brick exterior. I love it. I agree that in lesser hands yellow brick could look institutional...but in the Shepard House MM&W perfectly balanced the yellow brick with just the right amount of limestone trim. I drove o see this house 2 years ago on a drive from Boston to NYC. The yellow brick is a mellow, beautiful color. Each brick is wide and low...the overall effect really reminded me of Rome. It is an incredible house in person.